The Art & Speed Garage is an outgrowth of the success that we’ve had with vehicle restoration. Some of the cars we’ve consigned have needed more than detailing work and photography. Our inspections have found unexpected rust in floor pans, fluid leaks, worn out parts, cobbled electrical systems and low quality prior work. Part of the process of consigning our cars for sale includes correcting these deficiencies. We have the ability to make repairs and upgrades in-house, and also have a network of partners who provide the best services. We can also upgrade any car of ours you buy - air conditioning is a frequent modification. 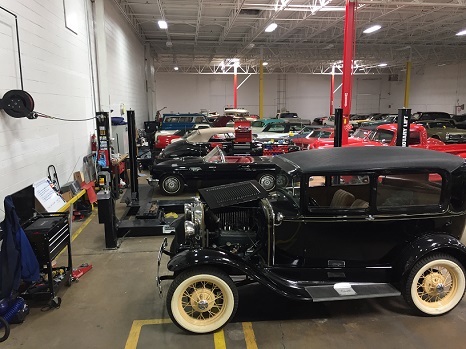 The Art & Speed Garage will offer services on vintage and collectible vehicles only. We will not be doing work on daily transportation. This focus plays to our strengths and limits distraction from our primary mission of connecting discerning buyers with the very best classic cars, muscle cars and luxury and high-end exotics. We can do anything from individual jobs to a full frame off restoration through our partner network. We can also perform accident repair in the unfortunate event of damage to your classic or luxury car. We are a dealer for nearly every vehicle accessory. We sell wheels, tires, suspension systems, brakes, and internal components. We expect the Art & Speed Garage to be a growing service line in the company that will reflect the same commitment to excellence and positive customer relationships that have earned us such a great reputation to this point. If you need service for your muscle car, classic car, or classic truck, please contact us today through our online form or by calling (901) 850-0507. Whether the job is large or small, you can rest assured that we will do the work with excellence.